The Amoena fashion camisoles are great in summer weather and can fit comfortably under your colder weather clothes. They have pockets to hold your prosthesis and are made with ultra soft Modla fabric. Trulife's Active flow swim forms are ideal for bathing suits and are made to withstand saline and chlorinated water. The breathable foam material provides support and structure. The lightweight beads inside prevent water absorption and dry quickly. Form comes in a satin drawstring bag which is water resistant. Additionally, they may be used for activities including sports, gardening and at home wear. We carry mastectomy swimsuits year round from several manufacturers. Sizes range from 8-24. They are available in a wide variety of colors and styles. Swimsuits are pocketed to hold breast forms. 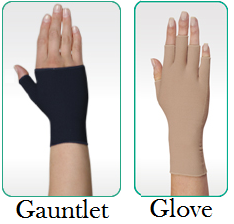 Dignity Products provides expert compression arm sleeve, gauntlet and glove products. Compression products are designed to control and contain swelling in arms and hands due to lymphedema. Additionally, these items can be used as a preventative onset of lymphedema when flying, in high altitudes or during repetitive activities. Gloves and gauntlets are available in limited colors, however the sleeves are available in a wide array of colors including tie-dyes and Juzo's Signature Print Series. Click here to go to Juzo's website and view the current sleeve and gauntlet prints. Note: Some insurances may help cover cost(s) of compression items. However, Medicare, Medicare replacements and Medicare supplements do not cover compression.